Highest craftsmanship with up to 1111 days of manufacturer's warranty for a strictly limited edition of maximal 999 exclusive pieces each style worldwide (depending on model). 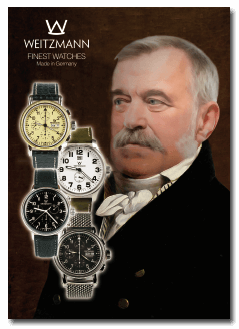 WEITZMANN watches and chronographs are manufactured professionally with the greatest of care and under stringent quality control in traditional watch factories. These exclusive masterpieces gleam with an unusual blend of high-quality materials, precision movements that are accurate to the second, and a modern and unusual design. Our measure of quality is your complete satisfaction: the WEITZMANN brand stands for fascinating, finest-quality watches, each detail made with care and the highest standards of technical precision. Exquisite watches that will accompany you the hole life. Deeply rooted in our company philosophy is the historical legacy of the modern art of watchmaking.